Due to vehicle traffic on Indianapolis Boulevard, the Indianapolis Boulevard Bridge will not open for tug and barge traffic between the hours of 5:45 AM to 7:45 AM and 3:15 PM to 4:45 PM, Monday through Friday. The Indianapolis Boulevard Bridge is expected to open approximately 8 to 12 times for every 24-hour period. The schedule provides that less than half of the bridge openings will occur during heavier day-time, weekday traffic periods. 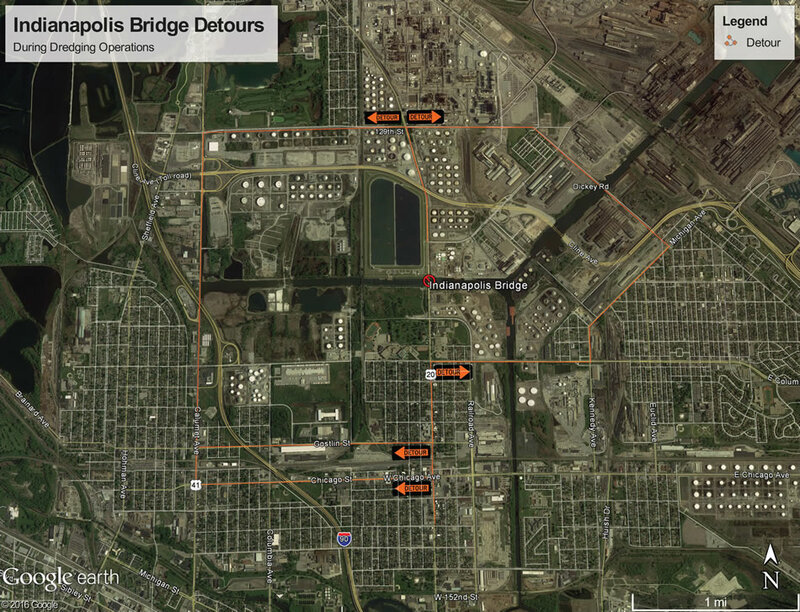 The Dickey Road Bridge already has some bridge openings due to barge traffic, and the dredging operation will add the same number of openings to Dickey Road as to Indianapolis Boulevard. In addition, all bridge openings will be coordinated by direct communication between the tug captains and the bridge operators. The bridge will be opened as the tug and barge approach, and it will be closed as quickly as possible once the tug clears the bridge. The goal is to minimize traffic disruption by having the bridge open for short durations. When the tug captains and bridge operators are well-coordinated, the bridge opening durations are less than 10 minutes each unless problems arise. The typical bridge opening durations in 2012 were approximately five minutes.